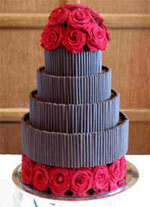 Providing inspiration on wedding cake options in UK. All information on these pages has been taken from genuine websites with the owners permission to give an accurate indication of prices that you should expect to pay and the types of cakes that are readily available. We hope these pages inspire you in designing your own wedding cake. If you don’t want pillars but want a tall, impactive design, then this is the cake for you. The cake has been designed to appear to be floating on a base of roses, with an additional display on top. It can also be made using either white or milk Belgian chocolate curls.